Our most prestigious model, the StorDigital ProBurner gives you great looks with its eye-catching, sleek, aluminium finish. The ProBurner units are available in two sizes: 1-7 target and 1-11 target, and can be supplied with DVD/CD, Lightscribe or Blu-ray burners. Not only is the StorDigital ProBurner the best looking duplicator we offer, it is also the most advanced whilst at the same time being extremely simple to operate. 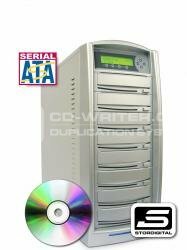 With the ability to accurately copy all of your CD configurations, all DVD configurations including Dual/Double Layer discs, as well as Blu-Ray discs including BDXL formats, the ProBurner is the perfect solution for all your duplication requirements. In addition to the usual AutoCopy, Load and Copy, Copy and Compare functions, the ProBurner has provision for Account Management (using password access), Hard Drive Partition Naming, Audio Track Editing and much much more. With the StorDigital ProBurner, you get a 128MB buffer memory as standard and the option to have an on-board harddrive up to 2TB in capacity. Though the standard ProBurner comes as a standalone copier, there is the option of PC connection via USB - where one writer can be accessed from your PC and written to as an external burner (through the Nero software supplied). You can also opt for Copy Connection which allows the ProBurner's harddrive to be addressed through your PC's My Computer - simply drag ISO images to the Duplicator folder and you eliminate the need to create a physical master disc. If you need to safe-guard your data, why not consider our Copy-Protect controller option? With Copy-Protect, you encode your master with our specially designed software and the subsequent copies your ProBurner delivers from the master are effectively copy-proofed (subject to conditions). Beyond the attractive look of this powerful duplicator, the aluminium casing with its original flip-up writer covers, provides the highest protection against heat and dust, two of the most dangerous elements that affect the life-span of a duplicator. This allows the unit to provide optimal performance for an extended period of time. Call us on 020 8293 0777 to find out more.